Especially now, plentiful job opportunities are key to making a great place to live. These 25 counties have experienced the most job growth over the last 10 years. 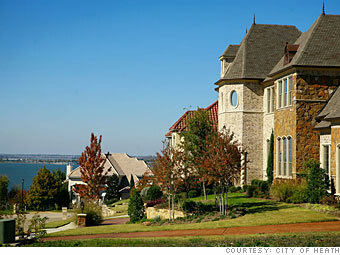 Rockwall County is rockin' and rollin' at the top of our list for job creation. It may be the Lone Star State's smallest county, but it's one of Texas's fastest growing, with a population that's almost doubled in the last decade. The county borders Lake Ray Hubbard in the northeast corner of the Dallas-Fort Worth Metroplex. Development there once centered on homes and recreation, but now Rockwall wants to be a place where its wealthy residents live, play -- and work. Like many of the counties on our list, Rockwall is luring businesses and jobs from nearby big cities with generous incentives and a higher quality of life. The latest development is Harbor Heights, a seven-story 110,000 square foot office tower slated to open next year. Major corporations like L-3 Communications and Pilgrim's Pride make their home in the Rockwall Technology Park where more companies are expected to join their ranks. Source: Census data, Onboard Informatics projection. Only counties where each Best Place within it was also experiencing job and population growth, and where unemployment was below the national average, were considered. No more than 2 places within a state could qualify.